Note: This post is really more about tech than skepticism. If such a topic holds no charms for you please skip this post. Paul Fidalgo is probably known by the reader as the communications director of the Center For Inquiry (CFI) and posting the Morning Heresy web news roundup during the week. Fidalgo is also a tech geek, and in particular, a fan of Apple products. I will not paint him with the 'fan boy' brush, although some might consider him one. 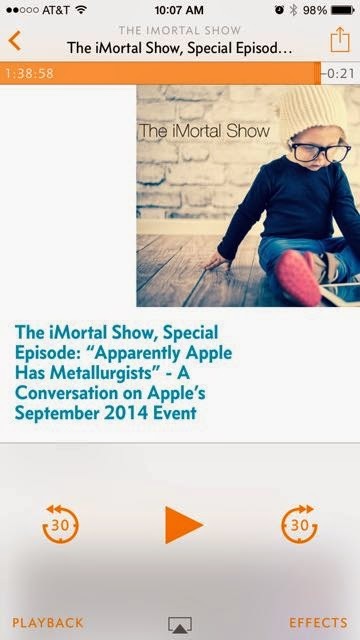 Fidalgo has a new tech/Apple-centered podcast called iMortal. He also has a blog by the same name. So far, five episodes have been released of which I listened to episode 4 and a special episode between episodes 2 and 3, which I shall refer to as 3.5. Both of these episodes revolved around one of Apple's two recent announcement events. Episode 3.5 covered the iPhone and Apple Watch event in September and Episode 4 covered the iPad and OS X Yosemite release event. As a person who enjoys his Apple gear, and enjoys Fidalgo's tweets on Apple and tech topics, I thought I would give the podcast a listen. I was pleasantly surprised. Fidalgo and his guests were not the typical tech journalist types that I hear on This Week in Tech, MacBreak Weekly, or the Ihnatko Almanac. Instead, they were knowledgable enthusiasts. While most of his panelists enjoyed their Apple gear, they were not Marco Arment zealots. His panel was a nice mix of ex-Apple store employees and enthusiasts and an Android chap. Having some experts discuss somewhat complex topics can sometimes fall flat on its face. A prime example was, speaking of Arment, the Neutral podcast. Three computer geeks discussed automotive topics, which was bad. Other than John Siracusa, who did research, none of the panelists knew what they hell they were talking about a lot of the time. I am no car expert at all, but I know enough to know when some folks are just embarrassing themselves and then uploading to the net. iMortal is not this at all. At least the two episodes I heard were able to strike a balance of keeping an interesting discussion moving forward without wandering into a no man's land of ignorant bliss. I also enjoyed it since, unlike a lot of tech pundits who have the ability either through disposable income or job perks to have hands on time with all the new gadgets that are released each year, the panelists have to husband their resources on what tech things they can actually purchase. This changes the dynamic to the types of conversations I have with my tech friends. I think this budget realistic view of tech came through with their discussion on the Apple Watch. It's a cool product. Sure I want one. No. I want two. One for myself and the editor, but at a starting price of $350.00 per watch and up what will it actually be useful to do with it? I have no idea. Hence, why would many people buy one? They also discussed Hidalgo's dabbling with a Moto X (which I find to be a very intriguing device) and Nexus 5. Apple folks open to other platforms is pleasant and refreshing open-mindedness. All in all, iMortal is a good Apple/tech podcast when you want to hear people talk about your favorite Apple gear in a down to Earth manner. I am not sure if this will make the regular podcast stable at this point, but if you like Apple gear, and John Gruber isn't doing it for you that day, this is clearly worth a try.